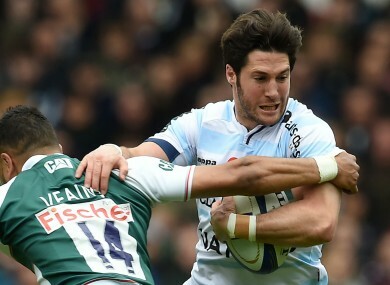 MAXIME MACHENAUD HAS his sights set on revenge in next month’s European Champions Cup final when Racing 92 take on Saracens. The Racing captain scored the opening try as the Top 14 side beat Leicester Tigers 19-16 on Sunday to reach their first continental final, while Saracens defeated Wasps on Saturday. Machenaud was part of the Racing side who were beaten by Saracens in last year’s competition, the Premiership leaders snatching a stoppage-time 12-11 win thanks to a Marcelo Bosch penalty. For Racing, it was a heart-breaking exit. “We are very happy to get into the final against Saracens,” the scrum-half told BT Sport. Sunday’s victory also sees Dan Carter stand on the verge of adding another trophy to his impressive honours list, the New Zealand international coming into this season having won last year’s Rugby World Cup. “It’s an amazing achievement, it’s part of the reason why I wanted to come and play here in France was this competition and it’s lived up to all the hype,” the four-time Super Rugby winner said. It’s amazing to play in and give ourselves another week in this competition. To be in the final is huge for this team as you can see by the celebrations. Email “Racing playmaker seeking revenge in Champions Cup final against Saracens”. Feedback on “Racing playmaker seeking revenge in Champions Cup final against Saracens”.